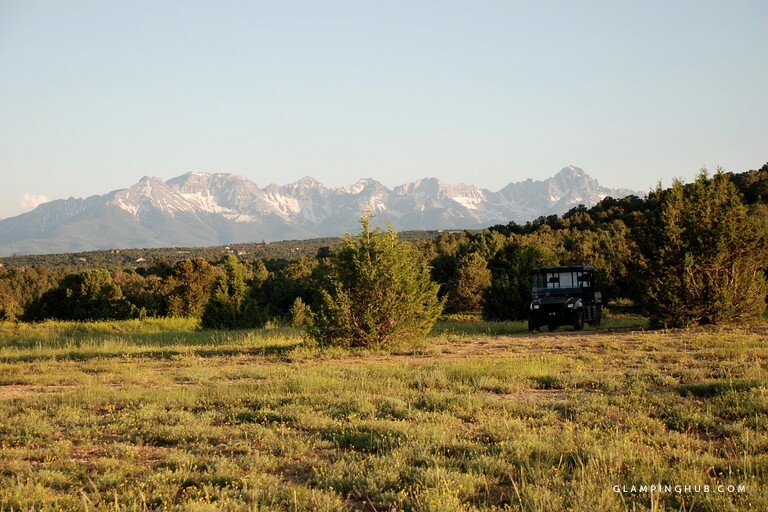 Set on 26 acres of stunning private land with epic views of the Cimmaron and Sneffels Mountain Ranges, this unique rental is near Ridgway, Colorado. 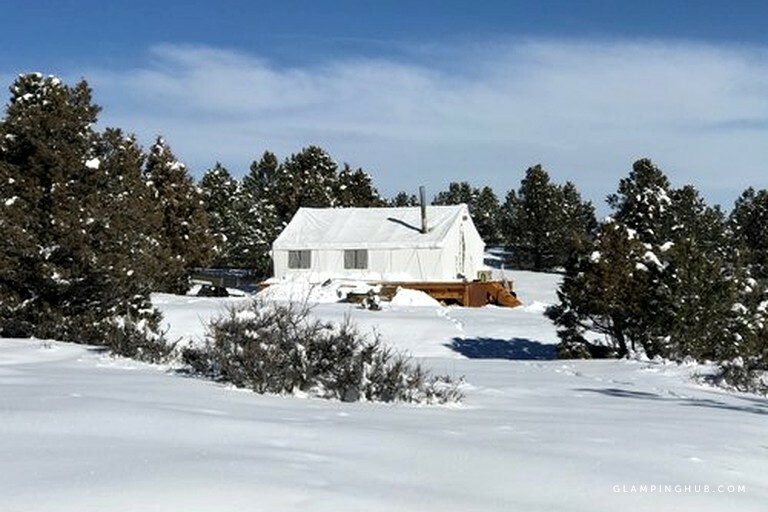 It is the perfect location for a couple to get away from it all and enjoy a vacation filled with incredible outdoor activities. A small family could also enjoy a trip here, as the hosts are able to provide twin-size floor mattresses for two extra guests accommodating up to four glampers in total. Guests are made to feel welcome the moment they arrive with a welcoming gift. 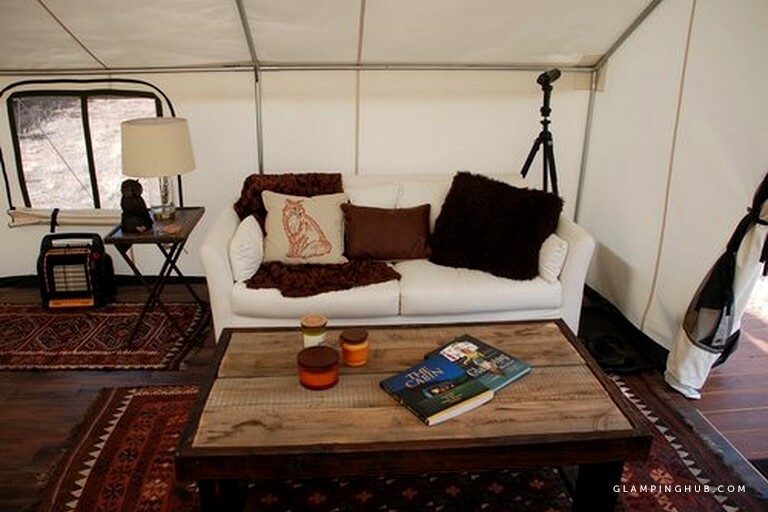 The inside of the tent has been beautifully furnished, and guests will almost forget that they are indeed in the great outdoors. 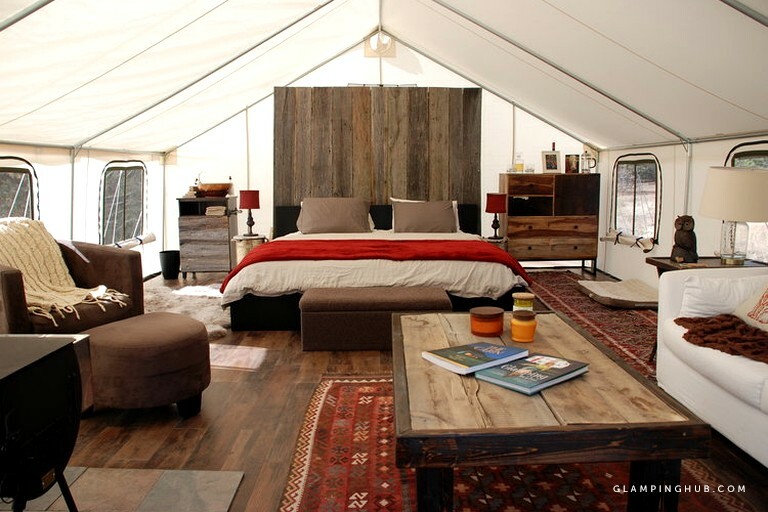 The hardwood floors and beautiful rugs give the tent a luxury feel. The rental even has electricity and running water. In the main accommodation, there is a king-size bed, a washbasin, a sofa, an armchair, and the propane heater makes this a cozy space all year round. Each morning, guests can enjoy a fresh cup of coffee thanks to the Keurig coffee machine. 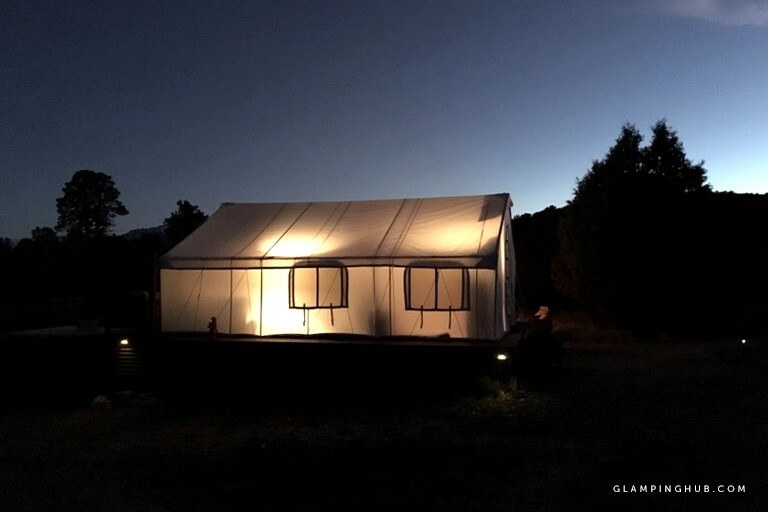 With all the 21st-century conveniences in the rental, guests will forget that they are staying in a tent. The rental has electricity and running water, as well as a propane heater. There is Wi-Fi, and also a selection of books and board games. 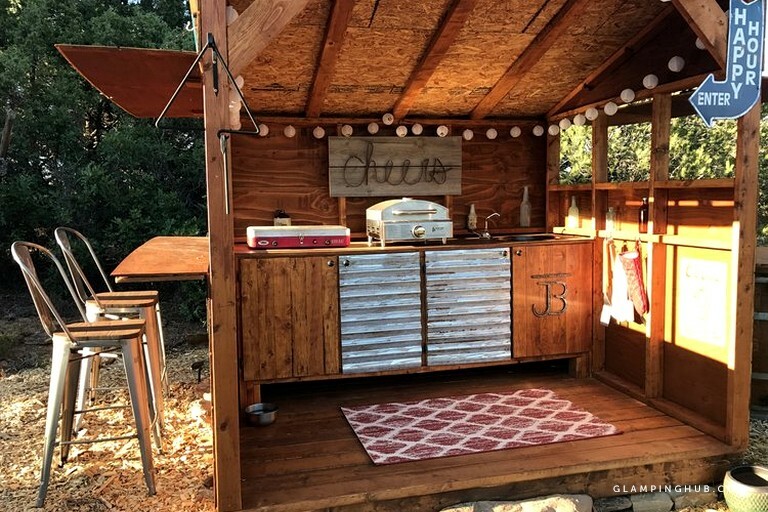 The separate cooking area is fully equipped and even has a pizza oven. Bed linens and towels are provided. Twin floor mattresses are available for an extra fee. Parking is available, and when guests return in the evenings, the pathways have lighting to guide them back to the rental. Depending on what guests want for their vacation, there are various three-night packages available from the basic accommodation package, allowing guests free rein during their stay, all the way to a fully-catered package with luxury items and activities available. 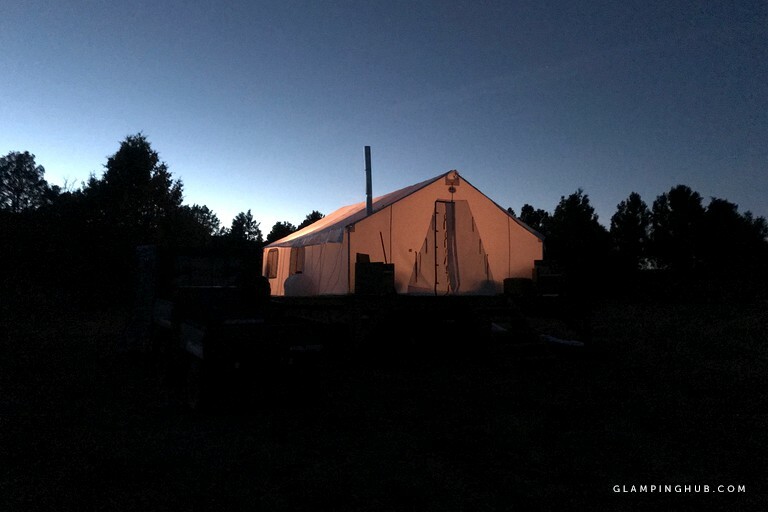 The 'Stay and Soak Package' includes three nights' accommodation in the luxury tent with access to all amenities, two single day passes to the Ouray Hot Springs, one full body massage per guest, two T-shirts, and a welcome gift upon arrival. 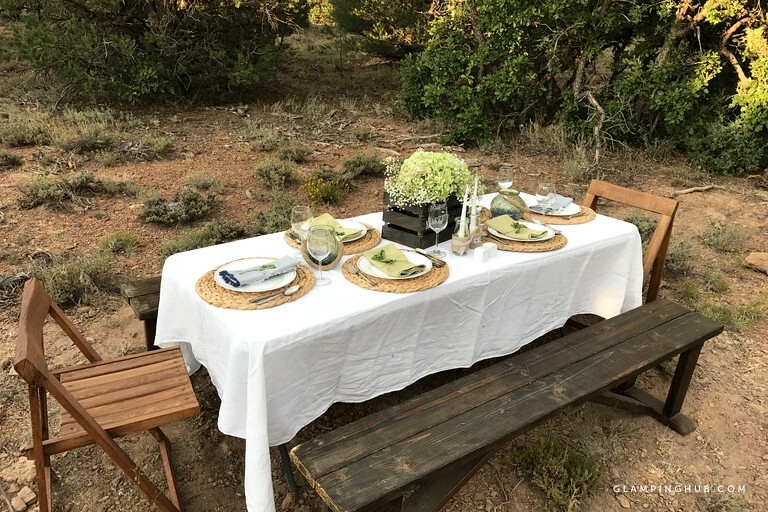 The 'Romance Package' includes accommodation for two in the luxury tent with unlimited use of all amenities and one chef-catered dinner with a wine pairing, whose menu will be agreed upon prior to arrival. 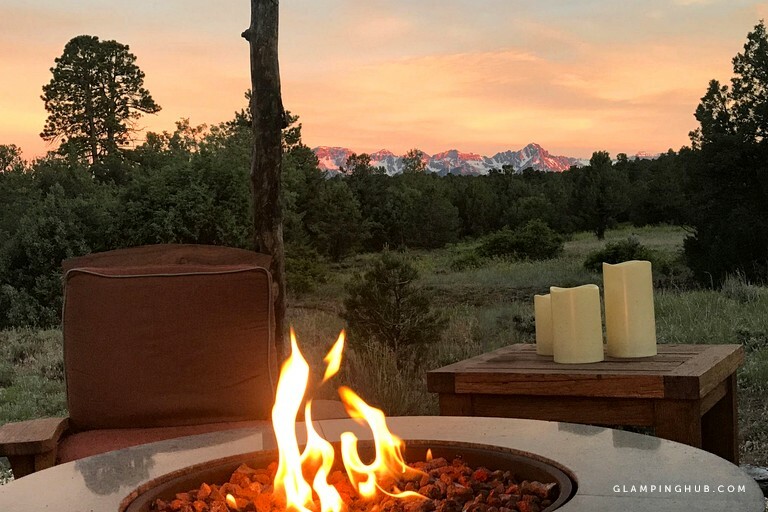 Guests will also enjoy champagne, flowers, and chocolate upon arrival, one spa treatment (per person), and two-day passes to the Ouray Hot Springs. Guests will be in an outdoor mecca when staying at this property. 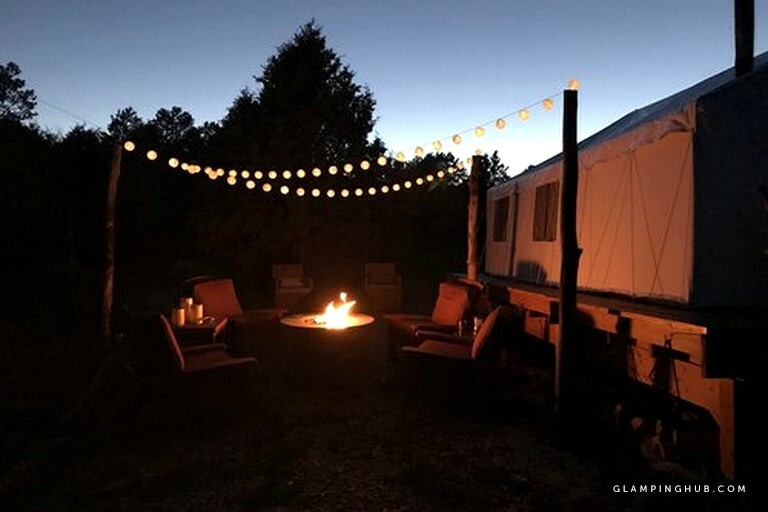 Within 15 minutes to an hour, guests can be mountain biking on world-class trails, hiking uncrowded trails, whitewater rafting, paddleboarding on the reservoir, Jeeping, walking on the creek path, skiing high alpine terrain, rock climbing, or simply enjoying the view and wildlife from the deck of the tent. This host requires a $300 security deposit paid via Paypal upon confirmation that will be returned back to the guest pending no damages. The rental is ideal for a couples getaway, however, the hosts will happily accommodate two extra guests for an extra fee per guest by providing two comfortable floor mattresses. Guests should contact the hosts to inquire.